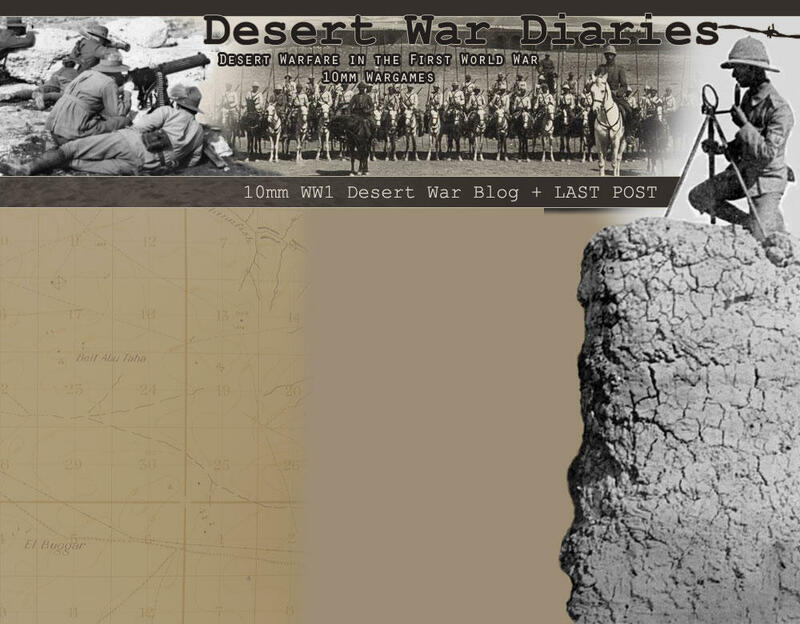 Great to hear from friends of WW1 desert war gaming. Just click on WeeWars Home above to contact Michael or better still, share a comment on either of these forums: The Pendraken Forum The Miniatures Page Forum Thanks to all who take the time to post – it really is good to know there’s someone out there! If you would like to return to this Blog by way of the last post entry, simply bookmark this page and use the Last Post button below to navigate to the last post entry. Alternatively if you’re a front-door sort of a person, bookmark the Home Page and use the Navigation Bar to navigate to new blog pages. In addition, the Blog Index can be accessed via the Navigation Bar. You made need to refresh a page. COPYRIGHT Unless credited, this Blog and all content, text, design and images remain my copyright: ©Michael Scott 2014. The content may be shared so long as the work is properly credited to me, Michael Scott or WeeWars, and my WW1 Blog.